A surgical incision is an aperture into the body to permit the work of the operation to proceed. In abdominal surgery, the routinely used incisions include the Lanz incision, midline and paramedian incisions, and the Kocher incision. The specific surgical incision will depend on the underlying pathology, site, patient factors, and the surgeon’s preference and experience. Once the operation is over, surgical excisions can be closed by sutures, staples, steri-strips, tissue glue, or a combination of these agents. The wound can be covered in a protective dressing and kept dry for a few days, before normal washing can resume. Post-operative antibiotics may be warranted depending on the degree of contamination. Non-absorbable sutures or staples must be removed; the time when they are removed may vary depending on the site and indication of the closure. Advise the patient should be advised to seek advice if any signs of infection or wound dehiscence. The Lanz and Gridiron incisions are two incisions that can be used to access the appendix, predominantly for appendicetomy. Both incisions are made at McBurney’s point (two-thirds from the umbilicus to the anterior superior iliac spine). They involve passing through all of the abdominal muscles, transversalis fascia, and then the peritoneum, before entering the abdominal cavity. The Lanz incision is a transverse incision, whilst the Gridiron incision is oblique (superolateral to inferomedial). Due to its continuation with Langer’s lines, the Lanz incision produces much more aesthetically pleasing results with reduced scarring. 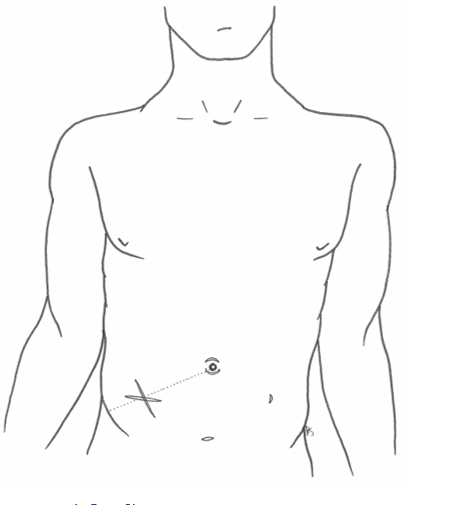 Figure 1 – Lanz (transverse) and Gridiron (oblique) incisions at McBurney’s point. The midline incision (no. ①) is used for a wide array of abdominal surgery, as it allows the majority of the abdominal viscera to be accessed. A midline laparotomy can run anywhere from the xiphoid process to the pubic symphysis, passing around the umbilicus. The incision will cut through the skin, subcutaneous tissue, and fascia, the linea alba and tranversalis fascia, and the peritoneum before reaching the abdominal cavity. As well as obtaining significant exposure of the viscera, this incision causes minimal blood loss or nerve damage, and can be used for emergency procedures. Its positioning however does make it susceptible to significant scars. The paramedian incision (no. ②) is rarely performed in the UK. It was originally used to access much of the lateral viscera, such as the kidneys, the spleen, and the adrenal glands. The incision runs 2-5cm lateral to the midline, cutting through the skin, subcutaneous tissue, and the anterior rectus sheath. The anterior rectus sheath is separated and moved laterally, before the excision is continued through the posterior rectus sheath (if above the arcuate line) and the transversalis fascia, reaching the peritoneum and abdominal cavity. The incision will take a long time and is often technically difficult, however it does prevent any division of the rectus muscle and provides access to lateral structures. A paramedian incision can damage the muscles’ lateral blood and nerve supply, which may result in the atrophy of the muscle medial to the incision. A Kocher incision (no. ③) is a subcostal incision used to gain access for the gall bladder the biliary tree. The incision is made to run parallel to the costal margin, starting below the xiphoid and extending laterally. The incision will then pass through the all the rectus sheath and rectus muscle, internal oblique and transversus abdominus, before passing through the transversalis fascia and then peritoneum to enter the abdominal cavity. Chevron / rooftop incision or modification (no. ④) – the extension of the incision to the other side of the abdomen. Whilst open procedures that come with inherent drawbacks, all these subcoastal incisions provide the surgeon with good exposure to the abdominal viscera and tend to heal well. Laparoscopic surgery (keyhole surgery) requires small incisions to be made in the skin, which allow instruments to be passed into the abdominal cavity. Common instruments include the camera, cutting and dissecting scissors, and grippers. The port sites will vary depending on the surgery being performed, yet the umbilicus is nearly always utilised as a port site to allow the camera to pass through. Which of the following is a subcostal incision used to gain access to the gall bladder? Which option correctly describes a Lanz incision? 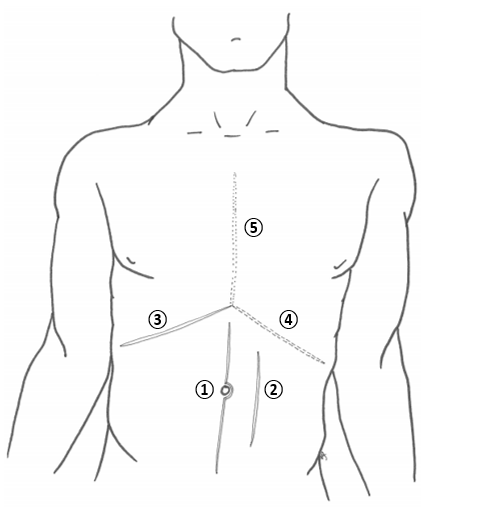 What is the classical indication for a Mercedes Benz incision?